I just finished another Isabel I biography: Isabella of Castile: The First Renaissance Queen by Nancy Rubin. What a fantastic, fast-paced work! This painstakingly researched 400-page historical biography of a five hundred-years-dead queen is as difficult to put down as The Hunger Games (but unlike Katniss Everdeen, this tough-as-nails female protagonist is completely real). During the Portuguese War Queen Isabel placed her daughter, Princess Isabel, in the safe keeping of her trusted friend Beatriz de Bobadilla. Beatriz was the wife of Andrés de Cabrera, the converso governor of Segovia, under whose rule the city was growing restless during the war. On 1 August 1476 Isabel was awakened by a messenger from Cabrera. 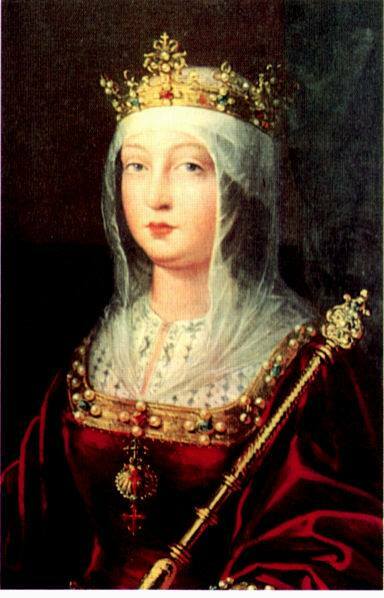 Segovia had revolted, and the life of the young princess was threatened. Fearing for her daughter’s life, the queen reacted “with much spirit” and determined to leave for Segovia at once. Without waiting for the royal army, Isabel set out for Segovia accompanied only by Cardinal Mendoza, the Count of Benavente, and Beatriz. Isabel and her three companions rode twenty-four hours without stopping, a long sixty-mile ride over mountainous terrain, and arrived at dawn. The queen and her companions entered the city, and despite their hostility the angry crowds did not hurt them as they rode into the square of the alcazár. They crossed the drawbridge and entered the courtyard beneath the tower where the young princess was imprisoned. Her companions begged her to close the gates against the angry mob, but Isabel loudly announced that all who wanted should enter the castle. “Viva la Reina!” the crowd shouted. The queen restored the castle to her command, and with five-year-old Princess Isabel in her arms rode to the palace.There she assured the Segovians that they “would no longer be troubled by [Cabrera]” because she was going to thoroughly investigate him. She then asked the citizens to send representatives to discuss their grievances. A case was presented, but the pacified Segovians conceded that abuses had really been “committed by his officials.” As a converso, hated for his wealth and influence, Cabrera had been a scapegoat for those who lusted after his position. Isabel knew “that this scandal had been incited by some nobles and rich citizens” and that Cabrera was actually a very shrewd administrator and fair governor. She thus commanded Cabrera be restored to his authority as governor of the city and the castle, and this time the Segovians did not protest. She left the city in peace and her daughter in safety, and returned to her duties at the war front. From Rubin, Nancy. Isabella of Castile: The First Renaissance Queen (New York: St. Martin’s Press, 1991), 152-153.